We do Weddings, Bar/Bat Mitzvahs, House Parties, Libraries, Pre-schools, Jewish Day Schools, restaurants, bars, clubs, and street corners. Our hora is not to be missed. We offer flexible, competitive rates and are happy to tailor our set to your needs. 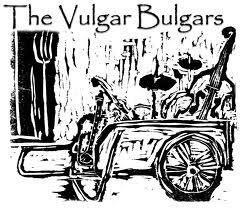 write to vulgarbulgars -at- gmail -dot- com.